Underground parking Put the placemark at the entrances/exits to the underground parking lot. If the entrance is a separate structure, it is drawn as a building of the appropriate type (see Section 3.4. Buildings). Don't draw the territories of underground parking and roads on their territory. 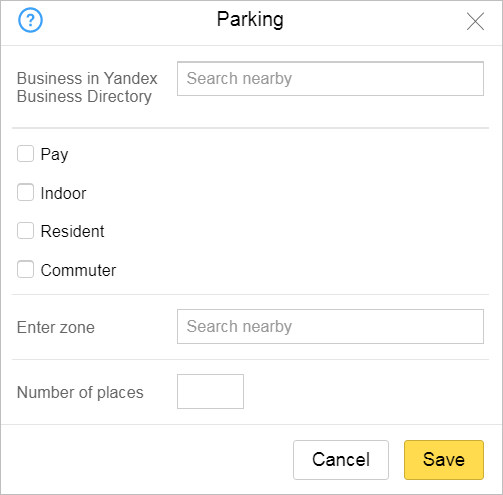 Put a placemark at the entrance to parking in buildings (including multi-level in special buildings) and also public parking that occupies part of a building. The building polygon is drawn in accordance with the rules for mapping buildings (see section 3.4. Buildings). Don't draw roads in multi-level parking structures and roads that lead to the roofs of buildings (such as in mall parking lots). Draw entrances to parking garages and cut the road off at the edge of the building (the entrance to the parking structure). Always draw expanded sections of roadways designated for parking (parking pockets) if they are on class-8 roads (for class 1-7 roads, see point 3.8.2.3.3). Territories that are specially designated for parking and are not roadways are designated with placemarks. Usually these are designated lots on the territories of organizations, malls, office centers, residential courtyards or between residential buildings and have entrances/exits. Put the placemark at the approximate center of the parking lot if there are several entrances. Put it at the entrance to the parking lot if there is only one entrance. 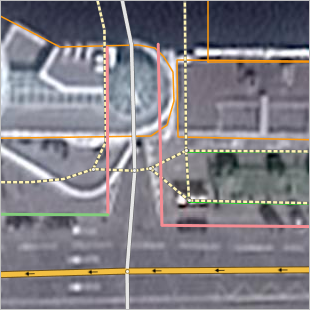 The methods of drawing and editing parking lots are similar to the methods of drawing and editing all of the place items on the Map Editor. See section 2.5. Places. Check the box if the parking is paid. Check the box if the parking is for residents. Residential parking includes lots where entrance is restricted to those with a permit. This designation also includes handicapped parking. For example: fenced in parking of various organizations, underground and ground-level parking at residential homes where entrance is restricted by a barrier or lifting gate. For resident parking, “don't check” the paid box. Check this box if the “Parking” item represents the entrance to an underground parking lot or parking that partially or completely occupies the building. Enter the number of parking spots. Draw lines of parking spots as simple linear items. 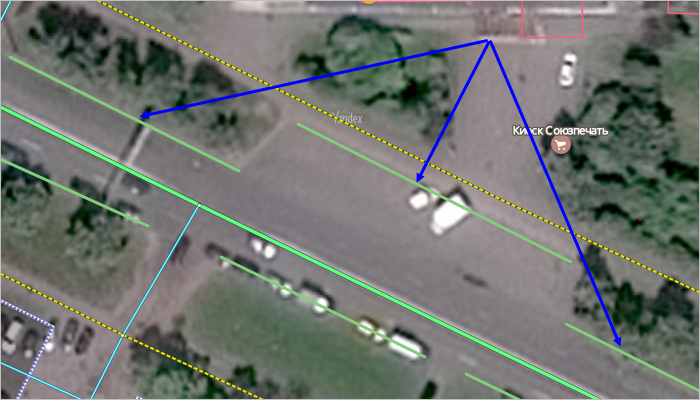 Only draw lines of parking spots that are located within localities. Only draw parking within localities if there are signs that explicitly allow/forbid/restrict parking. 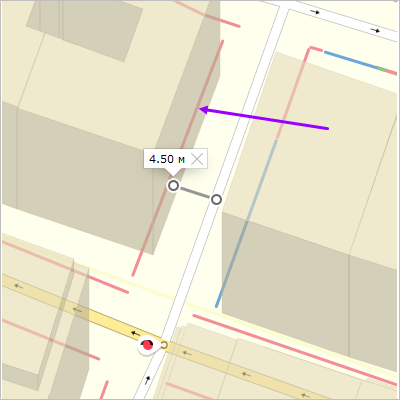 In cities, you can draw lines of parking spots in more detail along roads of class 1-7 if you follow the signs and markings (or refer to the traffic laws if there aren't any signs). 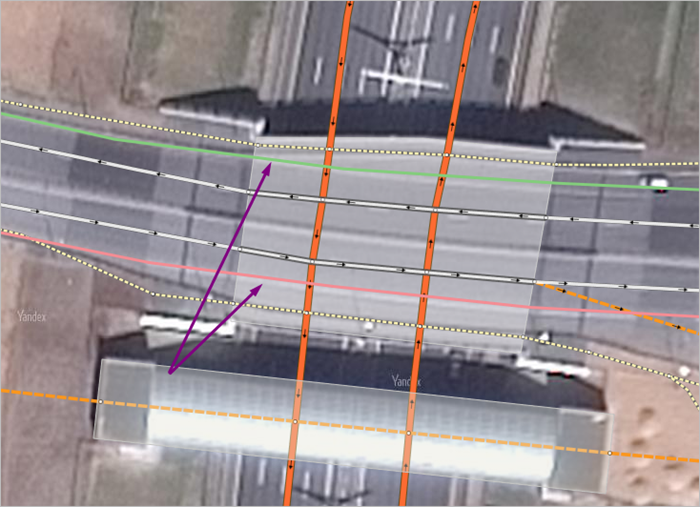 When drawing lines of parking spots, you must make sure that their shape corresponds to that of the road network on the map (since the satellite image may be outdated). 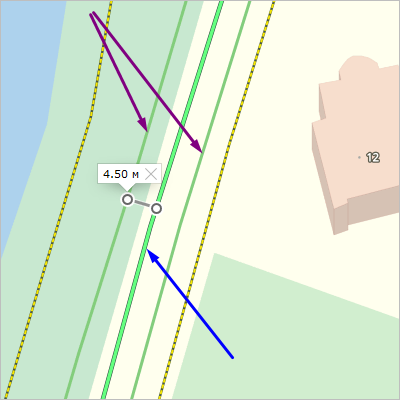 If the edge of a roadway is located 4.5 m or more from the line that represents a road section, then draw the parking line along the edge of the roadway. 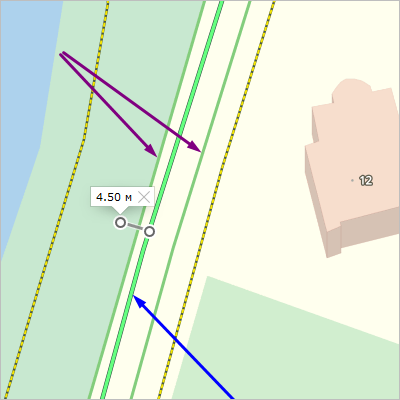 If the edge of a roadway is located less than 4.5 m from the line that represents a road section, then draw the parking line 4.5 meters away from the road line, even if this results in an intersection with vegetation or pedestrian paths. 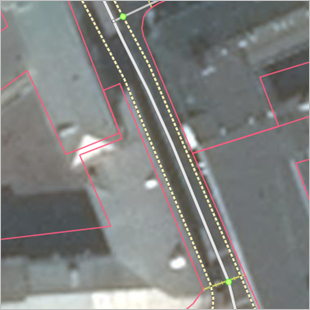 There are exceptions, such as if drawing the line at that distance will cause parking lines to intersect with buildings. In that case, draw the parking line along the edge of the building. 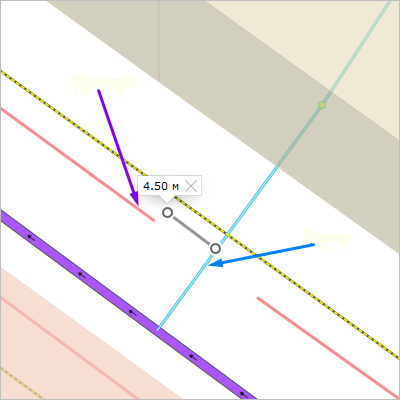 Lines of parking should not intersect with roads of class 1-8 except in cases when the road section and the line of parking spots are located at different levels. You can only allow linear parking to intersect with a building if the road that you are drawing the parking along runs through an arch. Don't draw parking in area where it is forbidden (such as between sections of a road drawn using two lines where the roadways are divided by a barrier, lawn, tram rails etc., or along exit ramps or u-turn areas. 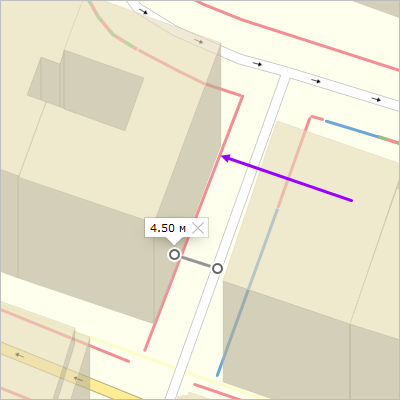 You can usually determine value of the Time limit attribute for linear parking based on road signs or markings (or refer to the traffic laws if there aren't any signs). Free parking — if signs indicate that parking is free. If you are allowed to park for free more than 40% of the time from 8:00 am to 8:00 pm during the month and the rest of the time parking is prohibited, then indicate that parking is free. If this condition is not true, then mark that parking is forbidden. Indicate that parking is paid if there are signs that indicate that you must pay to park at certain times (during even or odd days of the month, etc.) and at other times parking is forbidden. If parking along a street is for residents and only employees of neighboring organizations can park their cars there. Parking for customers of restaurants, hotels, etc. Forbidden parking — if parking or standing is forbidden. Attention. 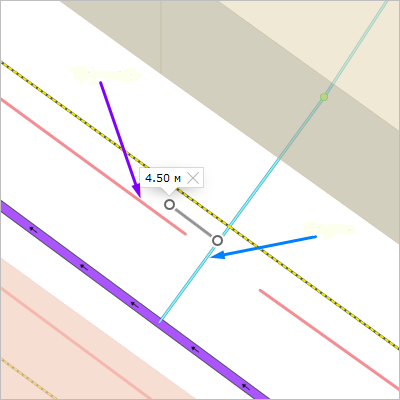 Don't use editing tools to create new items by dragging existing ones to the appropriate location and changing their size or attributes when you edit lines of parking.